I've seen and heard this verse quoted hundreds of times. It's preached, declared, scripted onto journal covers, coffee mugs and t-shirts. It's everywhere in the Christian church. In fact I doubt there's a Christian anywhere who does not know this verse. It came from Joshua at the end of his life, after taking the mantle of leadership from Moses, leading Israel into the Promised Land and guiding them to victory over their enemies for many years, after faithfully giving and living his whole life in God's service. Looking back on a long life Joshua was able to say this with true conviction. But there's more to this verse than just "as for me and my house we will serve the Lord." In fact, Joshua declared this to Israel for his own family, doubting that the rest of Israel could honestly make such a commitment before God about their own families. "Far be it from us that we should forsake the Lord to serve other gods..."
Joshua was still not convinced. Back and forth the conversation went, Joshua doubting, Israel declaring otherwise until Joshua reminds them that they are witnesses against themselves and God will hold them accountable should they turn from Him. Then Joshua died, and you know what happened? The very next generation, the children of those who had declared that they too would have their household serve the Lord always, DID NOT know the Lord. If this were now, and it was you and I who had said "As for me and my house we will serve the Lord", then that next generation who fell away would be our children. Does that hit close to home for you? It does for me. And that's why I'm going to put more time and intentional prayer into my children and their relationship with Christ. Most of them have no relationship at all with God, something which breaks my heart - but it breaks the heart of God so much more. These past few years I made a decision to press closer into God, to saturate my heart with Jesus, to study His Word and let it bring forth life and a voice to share what I learn...and it has required me to lay down many things, to surrender my will more times than I can count. In fact every day is another lesson in humility, in laying down 'me' to take up Him. Many days I fail, many times my selfish nature wants her own way, but more and more I'm letting Him lead the way, correct my attitude and shine the Light of truth upon situations where I am being deceived by worldly beliefs. This isn't a quick fix of Jenny, nor will it be perfected in my lifetime...but it's a decided path I'm taking, as is my husband. I am very careful about declaring what Joshua said, because once said it must be lived out, it must be followed through, and if I veer towards the world with its millions of 'gods' to worship even in the most obscure ways then I've lied to God. 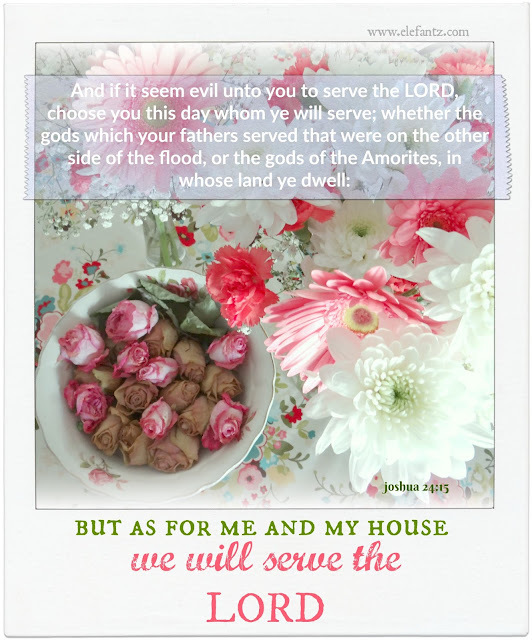 I want to serve God all the days of my life, and every day requires a fresh commitment, a decision (or many) to lay down self and do things His way...so I'm going to ask myself each morning, "Jenny, do you choose this day to serve the Lord?" and every evening, "Jenny, did you serve the Lord today?". Only by living this out day by day till my time on earth ends will my children know what following Jesus meant to my life and I pray that will steer them from the wide road which leads to destruction and on to His narrow road of eternal life. Only by witnessing my peace, my trust in Christ, my faith in God's Word, and my humility in admitting where I've gone wrong will they know I walked the walk. Only by looking back over my growth as a Christian since my conversion will they understand it can be done, that I believed it was worth every tear, struggle, loss, dying to self moment and triumph. Yes, take a lesson from Joshua's declaration, but make that decision every day because it's a very weighty oath and God will hold us accountable. A hard task ahead but we know everything is possible with God's direction. Jenny, when going through a very trying time when my children were adolescents I read somewhere to imagine yourself taking your troubled child, put them at the foot of the cross and give them over to the Lord especially when the worry and stress were almost unbearable. Of course I continued to pray for a hedge of protection around them every day but it helped to take my hands off so to speak. I've been doing that for 25 years, Nana Chel...since I accepted Christ and my (then) 14yo eldest son rejected Him. I will never stop praying that way, but as Christ's return draws even closer I am even more committed to lift each child before God's throne every day, as well as their spouses, partners and children. My prayer always includes "Lord, show them Jesus today, open their eyes to see Him and their heart to receive Him, and give them opportunity every day to accept Christ as their Saviour until they breathe their last breath in this life." God is faithful, and I know He does this...but I also know we have free will and ultimately it is up to each child to believe and follow Jesus. God will not force, but He will give them every opportunity as long as they live. I became a Christian many years ago and then some things happened in my life that instead of pulling closer to God, I chose to turn away. Yet, his love just would not let me go he held on so tightly to prevent me from totally turning my heart and soul away. After I met my husband, over 20 years ago (we met while working at the same place and became friends)he would mention verses or pull out his Bible during breaks and slow periods; therefore, occasionally, I would ask questions and discussions would begin. Now, these 20 years later, we are married and we both know that improvements are needed to get a step closer to being a better Christian through Christ. As for our children, both of my husband's daughters are so far on the flip side of serving the Lord, no actually even believing he exists, that so far ever effort we have mad has not worked in any way. We will continue to try and "Never Give Up"! My daughter does believe in the Lord, yet does not do much in the way of serving him aside from once in awhile saying a prayer or going to church once in awhile. Thank you Jenny for sharing this important message today and sharing your thoughts in this discussion. I will never stop loving His words. They are precious and I will live by them until I journey on. Thine will be here as it is in Heaven. Thanks for your comments on this passage of scripture. I know the pain of children not following Christ and need to be more disciplined to pray every day and to trust God. Thank you for these words of wisdom dear Jenny. I pray most days for my boys to return to their faith but maybe i need to be more disciplined in praying every day for them. I have one son that used to believe, but now doesn't, and doesn't like that we make him go to church with us each week (he lives in our house, so, has to live by our rules). Our other son is a believer, and works with the at risk boys in his church. Keep praying.